LG V40 ThinQ is a flagship smartphone tuned by Meridian Audio | What Hi-Fi? Can Meridian help LG take mobile music to another level? Since the two companies first announced their partnership in December 2017, Meridian Audio has already had a hand in tuning various LG soundbars and wireless speakers. So, it was only a matter of time before Meridian was let loose on a smartphone. But it's not just any old smartphone. The V40 ThinQ is LG's new flagship. The V40 features a 6.4in FullVision Quad HD OLED display, with 3120 x 1440 resolution. It's powered by Qualcomm's Snapdragon 845 processor and comes with 6GB RAM and either 64GB or 128GB of storage. Furthermore, according to LG, "when placed on a solid surface or hollow box, the LG V40 Thin Q acts like a woofer to amplify the bass even more." Interesting. The V40 also includes a DTS:X 3D Surround Sound mode in an attempt to deliver a more spacious and immersive sound to the listener. Besides the audio tuning, the other big news with the V40 ThinQ is that it sports not one but five different camera lenses. The rear camera uses three; a 16MP super wide-angle, 12MP standard angle and 12MP telephoto. The idea is to allow snappers more flexibility when it comes to framing and shooting. The front-facing camera features a 5MP wide-angle lens and 8MP standard angle. LG also claims the pixel size of the main rear camera sensor is around 40% better than the sensor in the LG V30. The V40's design features a smooth matte glass finish which is a result of LG's proprietary Silky Blast process, which etches the tempered glass back with microscopic pits. LG claims this makes the phone easier to hold and is more resistant to pesky fingerprints. There are four different finishes available: New Aurora Black, New Platinum Gray, New MoroccanBlue and Carmine Red. 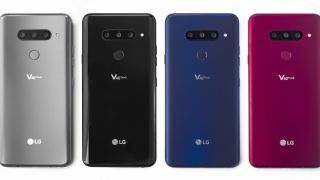 The LG V40 ThinQ officially goes on sale on Thursday 18th October but there's no word on UK pricing at the time of writing.